Since 2013, the armed conflict in South Sudan has forced numerous civilians to abandon their farmlands and livestock. The prolonged drought and deteriorating economy, with inflation rate reaching 800%, make the food crisis situation even worse. 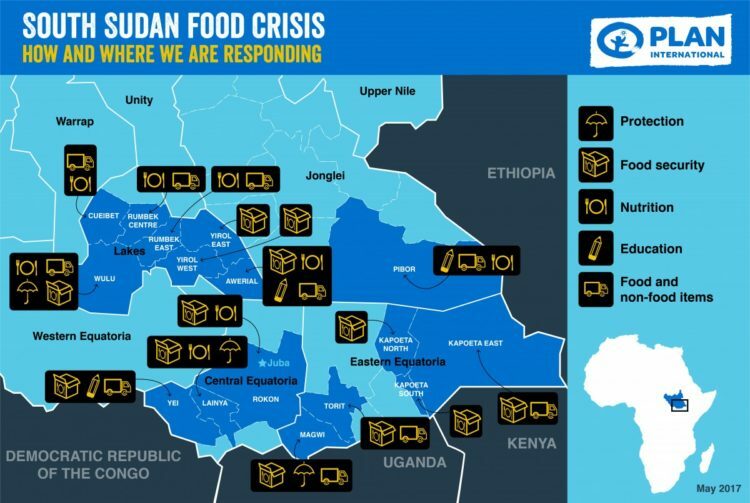 Finally, South Sudan has officially declared a famine status* in Unity State on 20 February 2017 and 100,000 people are facing famine conditions. 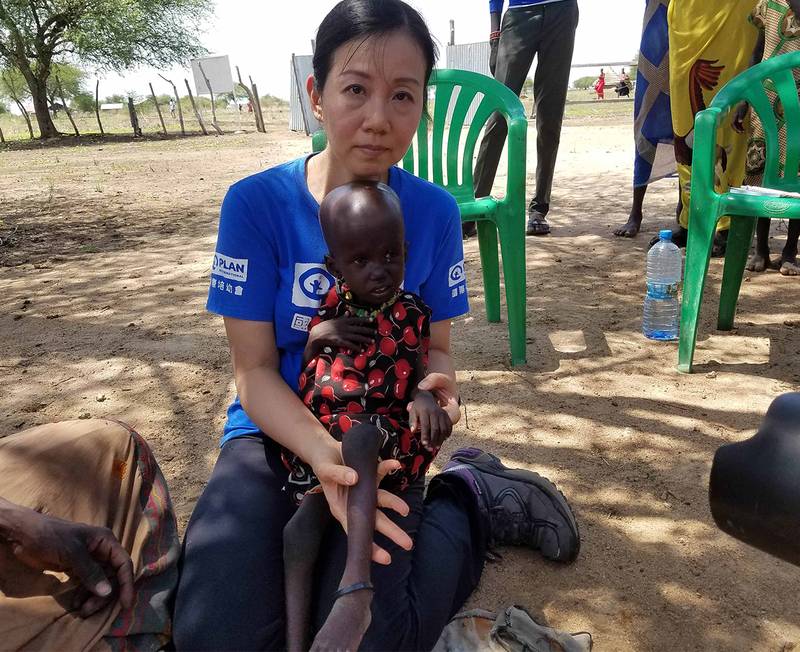 It is now more than 3 months since the famine broke out in South Sudan, yet, 5 million people – 40% of South Sudan’s population – are still in urgent need of food assistance. 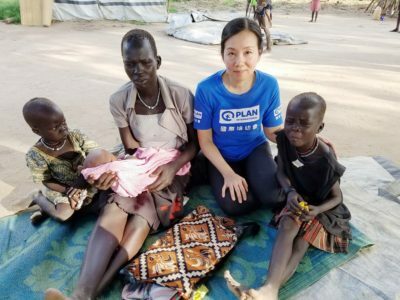 Kanie Siu, CEO of Plan International Hong Kong went to South Sudan in late May to visit families and oversee Plan’s relief projects there. The extreme weather has led to crop failure, which forced Lou’s family to sell the last cow to exchange for food 2 years ago. Since then, 3-year-old Lou has been suffered from severe acute malnutrition. 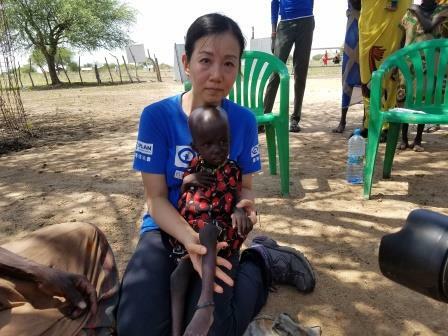 To save Lou’s life, her mother walked 12 kilometres to a health centre in Awerial, where Plan International is providing food and medication to needy children. “The centre is the only hope for my daughter to survive,” says Lou’s mother. 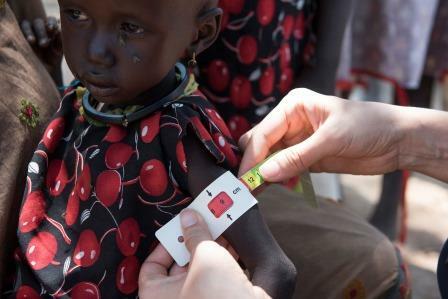 Lou’s arm with 8 .7 cm circumference (the same size of a 5 dollar coin) indicates she has severe acute malnutrition. Lou can barely stand and does not have the strength to wave away the flies on her face. The prolonged conflict has forced more than 1.8 million South Sudanese to flee to neighboring countries like Uganda, Ethiopia and Kenya. The number of internally displaced population has also reached 1.93 million. Anyik, aged 28, and her family, are forced to leave everything behind after the armed militia attacked their village. In partnership with World Food Programme, Plan has been providing food aid to the internally displaced families. Since the food aid supply is quite overstretched, the affected has to look for food elsewhere. Yet, it’s never easy for them to do so. “It eats me up seeing my children wailing with hunger in the night,” Anyik said helplessly. In fact, the current stock at the food distribution centres cannot cope with the immediate needs of the affected. When the last bit of food is gone, many children will suffer from severe acute malnutrition as Lou does. Our support is the only hope for them. Please lend a helping hand to the hungry children! 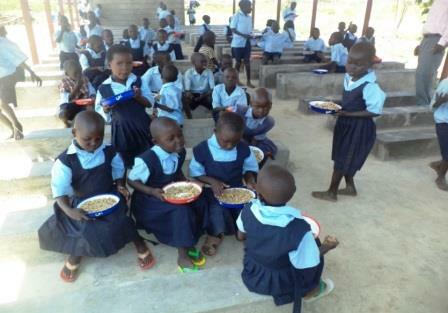 Anyik’s children enjoyed a meal at last, thanks to food aid distributed by Plan International. Plan distributes food to school children to encourage them to stay in schools. Plan is on the ground implementing emergency relief work and we need your support to help children in emergencies! Act Now before it is too late! Please mail or email the original bank receipt (mention: Africa Food Crisis) together with your name, address and telephone number to Plan International Hong Kong. Please mail the cheques payable to Plan International Hong Kong Limited. Please mention: Africa Food Crisis and write your name, address and telephone number at the back. *According to the United Nation, a famine is declared when three important conditions are met. First, more than 20% of the population has fewer than 2100 kilocalories of food available per day. Secondly, more than 30% of children are acutely malnourished. And thirdly, two deaths per day in every 10,000 people – or four deaths per day in every 10,000 children –caused by lack of food.